Didactic account of nationalism and empowerment in New York’s Puerto Rican community during the 1960s and ’70s. Melendez describes growing up in a poor, gang-ridden neighborhood that still valued its communal Puerto Rican heritage. He was gradually politicized, alongside like-minded comrades, at the local colleges that recruited them as token minorities: “We all wanted to look like, and emulate, Che,” he says of the Young Lords, a group that first attracted attention with a garbage-burning to protest inadequate trash removal in El Barrio (as opposed to affluent districts). The group’s m.o. became “a balance of embarrassing the state . . . and being able to present popular solutions to address the issue at hand.” The Young Lords occupied a conservative church that rebuffed their efforts at social programs, then formed their own underground wing (inspired by acquaintance with the violence-prone Weathermen), “dedicated to offensive and defensive military action under the political direction of the party.” This militancy was evident in later operations, like the hijacking of a city X-ray truck to draw attention to El Barrio’s TB epidemic, and a takeover of the South Bronx’s benighted Lincoln Hospital (where Melendez later contributed to a crucial heroin detox program), which stirred support from progressive doctors but resentment from the police. 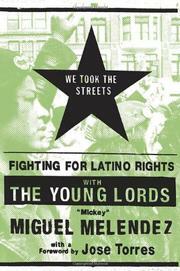 Inevitably, the Young Lords received hostile scrutiny from the FBI’s Cointelpro, and Melendez suggests the agency had a hand in member Julio Roldán’s death, which “was pivotal in bringing about our disintegration.” Although the group’s influence faded, Melendez continued to pursue Puerto Rican rights and independence. (He teaches today at Boricua College.) His memoir depicts turbulent times and exhaustively addresses the essential inequities in minority communities that provoked such strife. But his sonorous and preachy prose, seething with 30-year-old grievances, is not terribly inviting, and his revolutionary rhetoric is painfully dated. Nonetheless, these nostalgic depictions of direct-action protest may well inspire a new radical generation.